Aquatic Birds: Waterfowl populations have generally increased while wading bird, shorebird, and seabird populations have remained generally stable. Terrestrial Birds: Most terrestrial bird populations don’t exhibit clear trends, suggesting generally stable populations. Birds of Special Concern: Western snowy plover populations have recovered from low 1990-levels; Coos Bay’s North Spit appears to be one of the most productive snowy plover nesting habitats statewide. Both the marbled murrelet and northern spotted owl are declining throughout their range, but the rate of local decline appears to be slow relative to other areas in the Pacific Northwest. This chapter includes three data summaries:Aquatic Birds, Terrestrial Birds, and Birds of Special Concern— which describe the status and trends (where the data allow) of birds in the Coos estuary and associated uplands. The Aquatic Birds data summary focuses on birds primarily associated with aquatic habitats, including waterfowl, wading birds, seabirds, and shorebirds. Many aquatic bird species also depend on terrestrial resources. Where possible, information about the status and trends of aquatic bird species is presented at several scales, including: Pacific Flyway (including several states); Oregon (statewide); Western Oregon (several counties); and Project Area (several subsystems). For waterfowl, regional status and trends data (i.e., data for the entire Pacific Flyway) came from the United States Fish and Wildlife Service (USFWS) 2014 Pacific Flyway Data Book (Olson 2014). This source provides estimates for both historic and current waterfowl abundance in the Pacific Flyway, with information dating back to as far as 1955 in some cases. The Pacific Flyway Data Book was supplemented by USFWS Online data query tools, which contains information about waterfowl in both Oregon and western Oregon (USFWS 2014a). This tool provided data for both historic (as old as 1965) and current (2014) midwinter population estimates. USFWS data at the statewide level are presented along with results from the United States Geological Survey’s North American Breeding Bird Survey (BBS), which details statewide abundance trends (1966-2014) at 144 sites in Oregon (USGS 2014). Within the project area, data characterizing waterfowl abundance came from the Audubon Christmas Bird Count (CBC), conducted by the Cape Arago chapter of the National Audubon Society (Figure 1)(Audubon 2014). The local CBC has been conducted regularly since 1972. However, data gaps occur in years when the CBC was not conducted (i.e., 2010, 2014) and when the data were not entered into the Audubon web site (1987-1989). 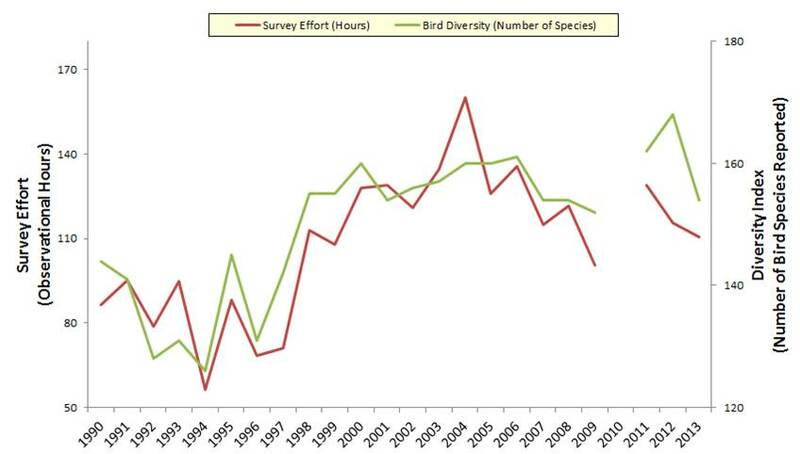 For the Aquatic Birds data summary, a 33-year CBC data range (1980-2013) was analyzed. CBC data from 1972 and 1974-1979 were excluded due to data formatting issues. Addressing those issues was beyond the scope of this project. For wading birds, seabirds, and shorebirds, data are available at both the statewide level and the local level. Similar to waterfowl, data at these scales came from the BBS and CBC, respectively (USGS 2014; Audubon 2014). Local data were supplemented by personal communications with local bird experts and unpublished manuscripts (Rodenkirk 2012; T. Rodenkirk, pers. comm., January 19, 2012). This data summary focuses on birds that are primarily associated with terrestrial habitats, including raptors, owls, songbirds, fowl-like birds, doves and pigeons, hummingbirds, and woodpeckers. Many of these species also depend on aquatic resources. Information about these species is presented at both a statewide and local level. Status and trends of terrestrial birds across Oregon came from the BBS (USGS 2014). Locally, data were provided by the Audubon’s CBC (Audubon 2014). Additional information about the breadth of the BBS and CBC data is presented above in the Aquatic Birds section. The presentation of data detailing local bird status and trends was supplemented by personal communications with local bird experts (T. Rodenkirk, pers. comm., January 19, 2012; R. Namitz, pers. comm., January 19, 2012). The temporal and/or geographic scopes of the data are not comprehensive. As mentioned, CBC data gaps occur in years during which the CBC was not conducted (2010 and 2014). An additional data gap occurs in 1987-1989 when local CBC data were not reported to the Audubon database (T. Rodenkirk, pers. comm., 2015). In addition, CBC data collection is focused on areas of suitable habitat that are easily accessible, and may be limited by other factors (e.g., volunteer time constraints, volunteer training). 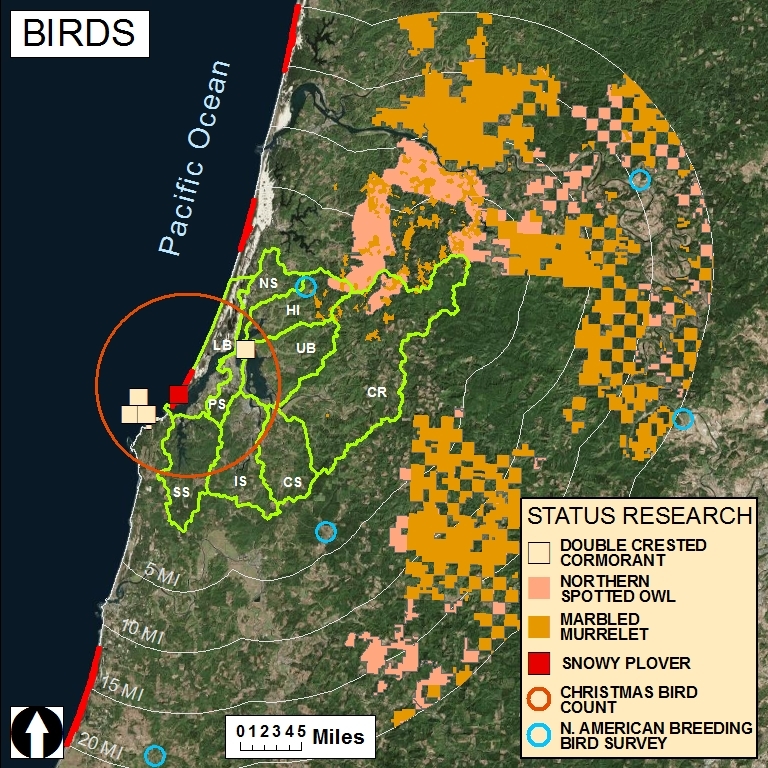 The BBS is conducted along 144 bird observation routes across Oregon. David Ziolkowski (pers. comm., November 24, 2014) explains that these routes are randomly selected to create a sufficiently large sample in order to “represent habitats in proportion to their natural occurrence on the landscape.” He adds that multiple studies have shown that this sample design effectively represents bird habitat, but, since “observational” routes occur along roads, open water habitats are slightly underrepresented while developed habitats are marginally overrepresented. Data from bird surveys are inherently subject to several “co-varying factors” that may be correlated with survey results (e.g., stylistic and skill differences between observers, survey effort, and habitat change). For example, imagine a hypothetical survey for which participation has increased steadily over time, and the raw data show that sightings have also increased. In this case, assuming that the number of sightings may be correlated with effort, it is difficult to determine what portion of the observed trend is due to a true change in bird abundance because some of the observed difference may have resulted from increased effort. To account for theses co-varying factors, the BBS processes its data using a Bayesian hierarchical model developed by the USGS (2014). The model calculates a relative bird abundance metric. In some cases, the reliability of model calculations is limited by deficiencies in the data (e.g., small sample size, poor precision, etc. )(USGS n.d.). Misidentification- Although volunteers are generally very knowledgeable about local bird species, experts speculate that some data may contain bird species misidentifications (particularly in the 1980s). For example, citizen scientists that participated in the CBC prior to 1982 may have misidentified long-billed curlew, mistaking this species for the whimbrel (Rodenkirk 2012). The abilities of volunteers- For example, song identification is the primary means for detecting the swamp sparrow; this skill requires advanced birding knowledge (Rodenkirk 2012). Therefore, it’s difficult to determine if an increase in swamp sparrow sightings corresponds to a true abundance trend. Western snowy plover(Charadrius alexandrinus nivosus; SNPL) data came primarily from the Oregon Biodiversity Information Center (ORBIC), which publishes the results of annual SNPL surveys in a series of reports (Lauten et al. 2012). These data were supplemented by additional SNPL surveys conducted by others with special interests (e.g., the Jordan Cove Energy Project) and state-sponsored research by the United States Army Corps of Engineers and USFWS (Hewitt et al. 2006; USACE 2007; USFWS 2013a). Information about double-crested cormorant (Phalacrocorax auritus; DCCO) populations came primarily from the United States Fish and Wildlife Catalog of Oregon Seabird Colonies (USFWS 2014b; Naughton et al. 2007). These data are supported by a USGS assessment of cormorant population trends in western North America (Adkins and Roby 2010). In addition, an Oregon Department of Fish and Wildlife (ODFW) study examining the cormorant diet composition in Oregon’s Tillamook estuary provided information about salmonid predation (Adrean 2013). Marbeled murrelet (Brachyramphus marmoratus; MAMU) population trends in the Pacific Northwest are well documented by a series of state-sponsored technical reports from the following agencies: United States Forest Service (USFS), United States Department of Agriculture (USDA), USFWS, Pacific Northwest Research Station, and Washington State Department of Natural Resources (Hamer and Nelson 1995, Raphael et al. 2011, Strong 2010, Falxa et al. 2011). This information was supplemented by geographic information system (GIS) shapefiles from USFWS and Oregon Department of Forestry marbled murrelet habitat designation (USFWS 1997 and 2011, ODF 2014). Spotted owl (Strix occidentalis caurina) population trends are also well documented by state agencies including USDA, USFS, and Pacific Northwest Research Station (Davis et al. 2011; Forsman et al. 2013). This documentation was supported by independent researchers (Forsman 1976,1977; Zabel et al. 1996; Courtney et al. 2004). Spatial information and critical habitat designations came from USFWS publications (USFWS 2012, 2013b). Survey effort- Changes in effort may correspond to changes in some abundance metrics (e.g., species diversity)(Figure 2). Habitat change- Habitat change within the survey area may result in a redistribution of bird species. For example, the natural succession of forest habitat in an undisturbed area may result in the redistribution of species that require open canopies to areas of less dense vegetation (e.g., clear cuts in the uplands), potentially resulting in a lower raw count even though total abundance may remain unchanged. Climate variables (e.g., El Niño events)- The arrival and departure of migratory birds to the lower Coos watershed is often a function of climate variables (e.g., year-to-year changes in temperature and precipitation). In years with climatic anomalies, the timing of the CBC may not correspond with the presence of every species that winters in the Coos estuary. In lieu of statistical modeling, local bird experts were consulted to help distinguish between true abundance trends and observed patterns likely caused by other factors (Rodenkirk 2012; T. Rodenkirk, pers. comm., January 19, 2012; R. Namitz, pers. comm., January 19, 2012). Consultation with local experts also helps identify known inaccuracies in the Audubon (2014) data. For example, Rodenkirk (pers. comm., 2015) explains that CBC volunteers frequently confuse the short billed curlew with the long billed curlew. Although the short billed curlew is a very rare sighting in the lower Coos watershed, the raw Audubon (2014) data report a high number of sightings on a regular basis. These inaccuracies are not corrected by the Audubon Society prior to publication. To avoid including inaccurate data, the trends from Audubon (2014) have been carefully scrutinized and compared against reliable, unpublished data from local experts (T. Rodenkirk, pers. comm., 2015). The data may also be subject to technological limitations. For example, counts of double-crested cormorant colonies are conducted by low-altitude aerial photo analyses. In some cases, these methods limit experts’ ability to discern between cormorant species (J. Lawonn, pers. comm., 2014). This report only used data from aerial photos that were positively identified as double-crested cormorants. Both the BBS and the Catalog of Oregon Seabird Colonies use breeding population counts as proxies for abundance. Experts suggest, however, that the use of breeding populations alone may underestimate bird use of estuarine habitats since breeding population data don’t include non-breeding birds foraging in the estuary (Adrean 2013). Both CBC raw data and BBS relative abundance data are meant to index overall inter-annual trends in bird abundance (i.e., changes in relative abundance from one year to the next). These data should not be interpreted as estimates of the total population size. Due to methodological differences between these surveys, extreme caution should be taken when making direct comparisons between data sources. Finally, it should be noted that two sources were used in compiling marbled murrelet habitat data. Both data sources were combined to produce a general idea of marbled murrelet nesting habitat abundance in the project vicinity. Federal critical habitat designation is based on computer modeling of habitat suitability and state habitat designation is based on field observations of marbled murrelet nesting behavior (ODF 2014, USFWS 2011). Forsman, E. D. 1976. A preliminary investigation of the Spotted Owl in Oregon. [M.S. thesis]. Oregon State University. Corvallis, OR. Forsman, E. D. 1977. Spotted Owl abundance in young versus old-growth forests, Oregon. Wildlife Society Bulletin 5: 43-47. Hewitt, R., K. M. Burton, and S. J. Tucker. 2006. 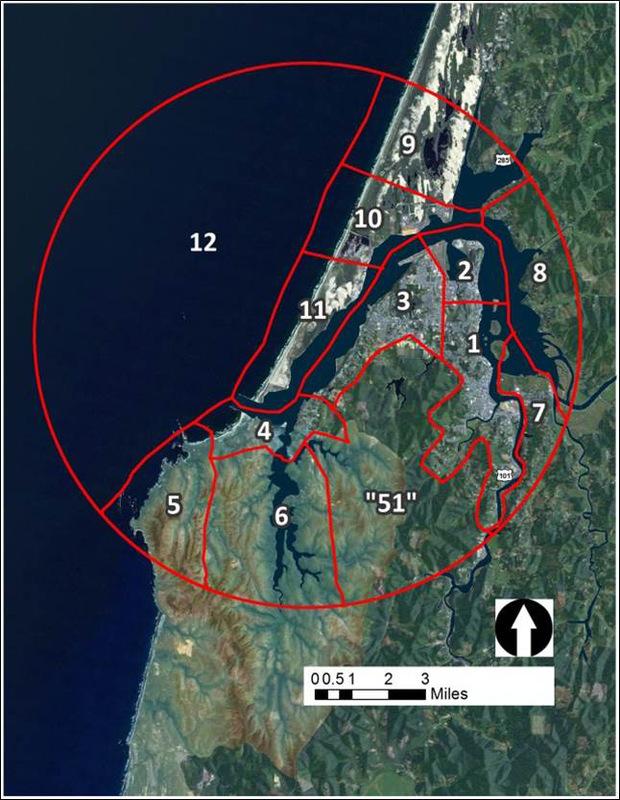 2005-2006 Pre-Construction Wildlife Surveys for Proposed Jordan Cove Liquefied National Gas Plant, Coos Bay, Oregon. [Report prepared by LBJ Enterprises, Eureka, CA]. Oregon Department of Forestry (ODF). 2014. Marbled Murrelet Management Area shapefile. Raphael, M. G., G. A. Falxa, K. M. Dugger, B. M. Galleher, D. Lynch, S. L. Miller, S. Kim Nelson, and R. D. Young. 2011. Status and Trend of Nesting Habitat for the Marbled Murrelet. [Technical Report from the United States Department of Agriculture, United States Forest Service, and Pacific Northwest Research Station]. Strong, C. S. 2010. Population and Productivity Monitoring of Marbled Murrelets in Oregon During 2009. [Report prepared by Crescent Coastal Research for the United States Fish and Wildlife Service]. United States Fish and Wildlife Service (USFWS). 1997. Recovery Plan for the Threatened Marbled Murrelet (Brachyramphus marmoratus) in Washington, Oregon, and California. Portland, OR. 203 pp. United States Fish and Wildlife Service (USFWS). 2011. Marbled Murrelet Critical Habitat Shapefile. United States Fish and Wildlife Service (USFWS). 2014b. Catalog of Oregon Seabird Colonies. [Unpublished data].